Shadows of Mysterious Warriors Fill the Mountain Passes! Year after year, members of an infamous ninja clan descend from their mountain hideout to pillage nearby villages. Those cruel night warriors steal precious food supplies needed to survive the harsh winter among the snow-capped peaks but they are too proud to toil in the dirt or breed their own cattle. Instead, they prefer to take what they need from helpless peasants. Until now, they have faced no opposition. This year that's about to change. The villagers from one tiny settlement have decided to fight back and stop the encroaching nightmare. Using their meagre funds, they hired seven daredevils - bold (or foolish) enough to raise arms against the ninja. These seven ronin, lordless samurai are as desperate to survive the winter cold as the villagers they have been hired to defend. As the shadows begin to stir in the forest, their courage is about to be put to the test. Will they manage to stop the mysterious raiders? Or will the black-clad brutes once again relieve the poor villagers of their hard-earned crops? 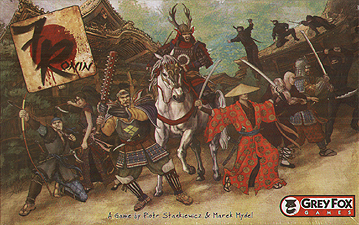 7 Ronin is an asymmetrical board game for 2 players. One player becomes the chieftain of a ninja clan trying to raid the village and take needed supplies. The other player commands a group of seven ronin who are doing their best to protect the villagers. It will be your task to strategically deploy your limited forces and attack your opponent where they least expect it. In order to win, you will need to use the special abilities of the ronin or occupy key village areas and intuitively anticipate your enemy's moves. Both sides must hurry - although the defenders are getting weaker with every passing round, the attackers need to retreat before the snow fills the mountain passes and makes hiding in their fortress impossible! Will Courage of the Few Prevail Against Cunning of the Many?